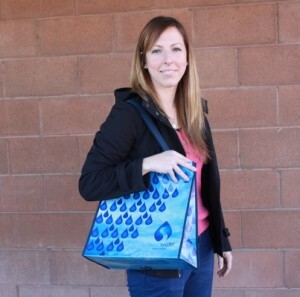 Clean Water Program Curbs Plastic Bag Pollution – Get Your Free Reusable Bag Friday at Pac N’ Save! Clean Water Program member agencies throughout the county are hosting reusable bag giveaway events to help residents get into the habit of bringing their own bags. In support of the countywide reusable bag ordinance that went into effect Jan. 1, Alameda County’s Clean Water Program will give away reusable bags on Friday in front of Pac N’ Save, San Pablo Avenue at 40th Street, 3 pm to 5 pm. The ordinance prohibits stores that sell packaged food or alcohol from giving away single-use bags at checkout, and requires them to charge a minimum of 10 cents per paper or reusable bag, as an incentive for shoppers to bring their own reusable bags to the store. The Clean Water Program works to protect creeks, wetlands and the Bay in Alameda County. Each year, the equivalent of 100,000 kitchen garbage bags worth of litter end up in our local waterways, including an estimated 1 million disposable plastic bags. In Alameda County, storm water does not pass through a water treatment plant. This means that litter and other pollutants carried into the storm drain system by wind and water flow directly into creeks and the Bay, where they harm fish, marine mammals, and birds. So get your reusable bag and pledge to bring it to the store, doing your part to keep our creeks and the Bay clean and healthy!